The Last Quarter Moon is Friday October 1. 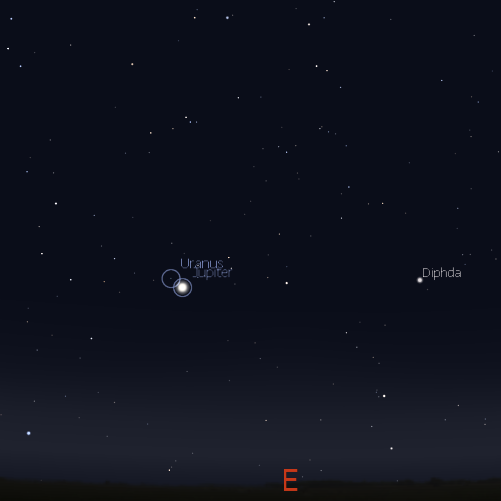 Mars, Venus and Spica form a broad triangle in the sky. 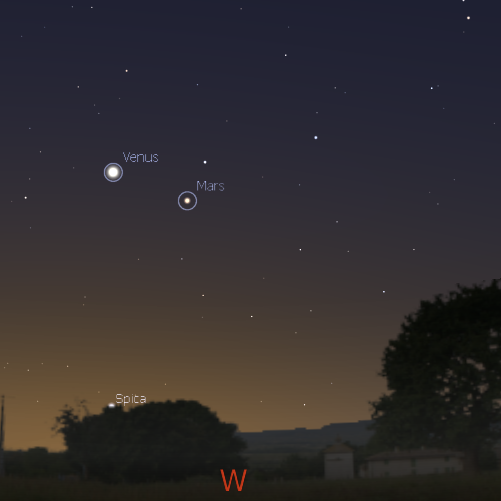 Venus and Mars are at their closest on Saturday October 2. 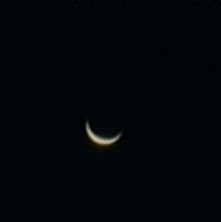 Venus's crescent shape is easily seen in small telescopes. Jupiter is easily seen in the evening sky. Jupiter and Uranus are seen close together in binoculars. 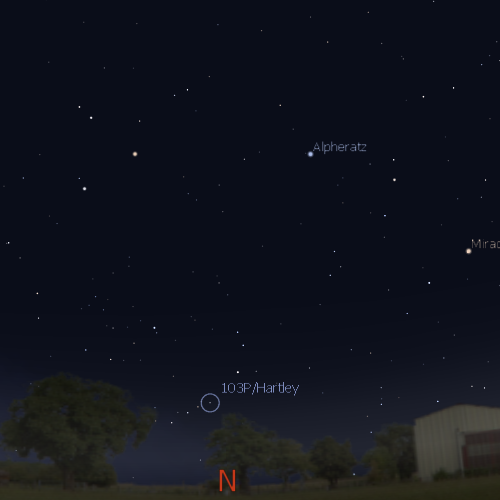 Evening sky looking East as seen from Adelaide at 8:30 pm on Friday October 1 showing Jupiter close to Uranus. Jupiter is just past opposition, but is still excellent in telescopes and binoculars. 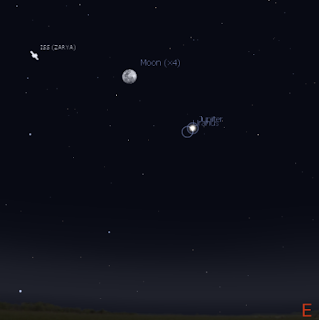 Similar views will be seen elsewhere at the equivalent local time. Click to embiggen. The Last Quarter Moon is Friday October 1. 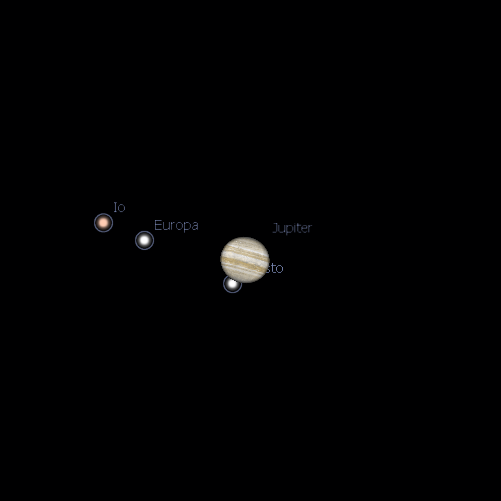 Jupiter rises in the early evening, and can be readily seen from about 7:00 pm local time just above the eastern horizon. During the week you can see bright Jupiter rising in the east while Venus is still in the west. Jupiter was at opposition on Tuesday September 21, when it is was its biggest and brightest as seen from Earth. However, Jupiter will still be excellent in binoculars and small telescopes for many weeks to come. Jupiter and Uranus are close together and can be seen near each other in a pair of binoculars. Uranus is the brightest object within a binocular field north of Jupiter, and is in fact bright enough to be (just) seen with the unaided eye under dark sky conditions. A binocular spotters map is here. Io and Europa pass each other on October 1 at 00:10 ACST (00:40 AEST). Jupiters' Moons are a easy to see whether you have binoculars or a telescope. Watching their eternal dance is always rewarding. On the morning of Friday October 1 September, Io and Europa pass close to each other. Unfortunately this occurs fairly early in the morning in the eastern and central states, starting 00:40 (AEST) or 00:10 (ACST). However, Jupiter is quite high in the sky, and viewing should be excellent . 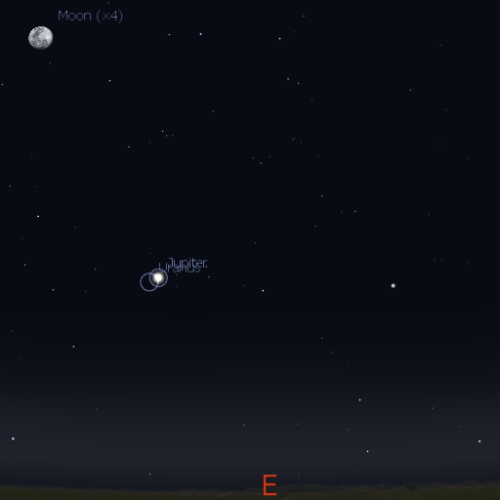 There are lots of opportunities in the rest of the month to see cool Jupiter Moon events (scroll down until you hit Jupiter). 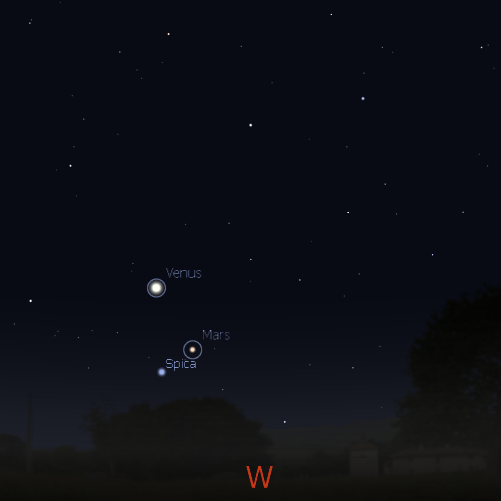 Evening sky looking North-west showing the Venus, Mars, and Spica at 7:00 pm local time on Saturday October 2. Click to embiggen. Venus is in the constellation of Libra, the Balance. 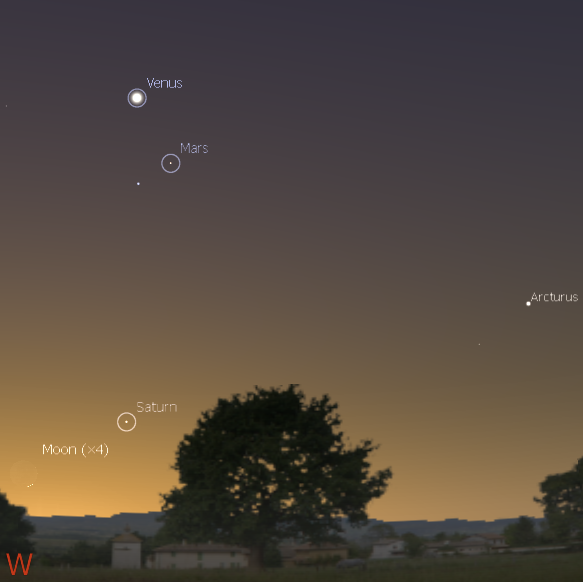 Venus is close to Mars , and they are closest on Saturday October 2. 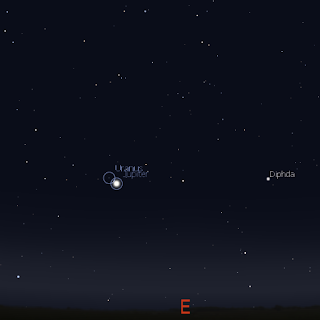 The bright star Spica (alpha Virginis) is below the pair, forming a broad triangle. Venus and is a visible crescent in small telescopes and 10x50 or stronger binoculars. Mars is distinguishable by its reddish colouring and is the brightest object near Venus. Saturn is now lost in the twilight. Venus is a distinct crescent, and grows measurably bigger during the week. In my 10x50 binoculars on a tripod mounting Venus is very small but the crescent shape is easily visible. If your binoculars don’t have decent anti-glare coatings, you may have to observe in the early twilight in order to see Venus’s shape without internal reflections from the binocular lenses getting in the way. Seeing Jupiter's Moons with the Unaided Eye. 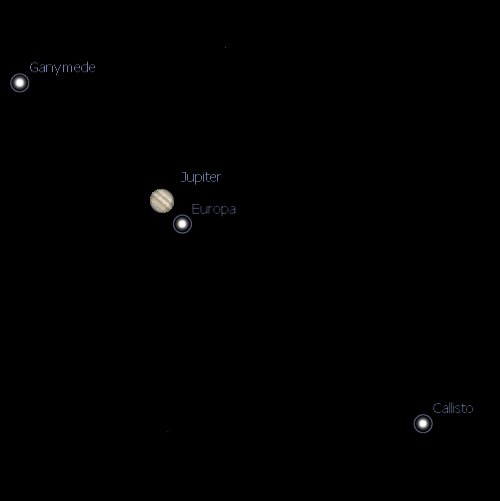 Left image, Jupiter at 11:00 pm on Monday 27 September; Right image, Orientation of the Moons, Callisto will be to the right and below Jupiter, Ganymede will ne up and to the left. It is not commonly known, but Jupiter's moons are bright enough to be seen with the unaided eye. However, they are so close to bright Jupiter that the intensity of it's light (and the optical imperfections of our eyes), makes it impossible to see them except under special circumstances). 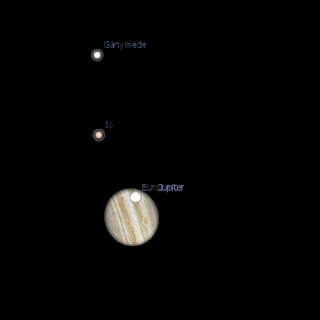 At opposition bright Ganymede (mag 4.6) and Callisto (mag 5.7) can be far enough away from Jupiter to see when they are at their maximum distance from Jupiter in their orbits. Jupiter's light will still probably obscure them for all but those with the most sensitive vision. However, if you use a wall or post to just block out Jupiter's light, you should see them pop into view. A good opportunity is on Monday , September 27. 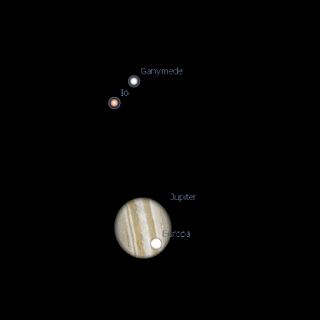 Both Ganymede and Callisto will not be at their maximum separations from Jupiter (Ganymede's occur during the afternoon, and Callisto's after the Moon has risen), however at 8:00 pm Ganymede will be at 336 seconds from Jupiter, greater than the 208 arc second of epsilon Lyrae, a double star that is just separable by people with good eyesight, and almost as big as the easily separable alpha Capricornii (380 arc seconds). Callisto will be 630 arc seconds from Jupiter, but at magnitude 5.7, you will need a dark sky site and blocking Jupiter's glare to see it. You will also need to look before the Moon rises high enough in the sky to drown out its light. You will need a handy wall or post. If looking for Ganymede earlier in the evening, a horizontal object would be better, as Ganymede is more above Jupiter than to the side. Stand so that you can hide Jupiter behind the blocking object by just slightly turning your head. Move so that Jupiter just is blocked, then allow your eyes a few moments to adjust from the brightness of Jupiter, and the Moon should "pop out". Ganymede will be easier to see than Callisto, due to its brightness. 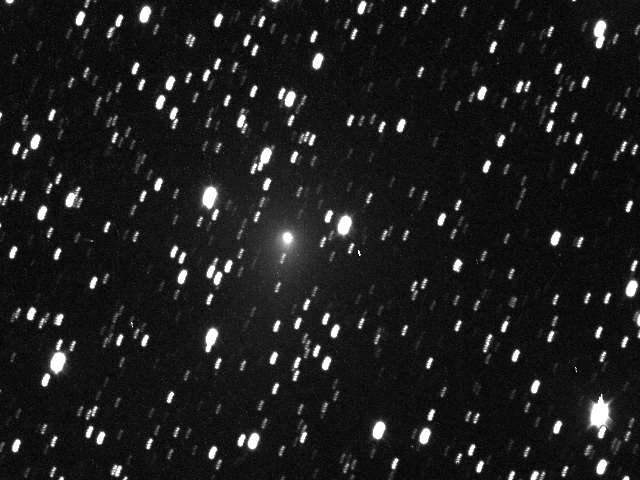 Back in 2008 Comet Al and I were trying to confirm a comet position in images from STEREO A. I pointed out the nice bright comet moving across the STEREO image field and Comet Al said, "That's not a comet, that's Mercury!". We exchanged the internet equivalent of startled looks. The feeling on the Stereohunter list was that it was an artefact, but I remembered an article on sodium emission from Mercury, and went to track down the group and ask them what they though our tail might be. So began a saga that cumulated in the paper "Observations of Mercury’s Escaping Sodium Atmosphere by the STEREO Spacecraft" by Carl Schmidt, Jeffrey Baumgardner, Michael Mendillo, Christopher Davis and Ian Musgrave being read at the European Planetary Science Congress today. 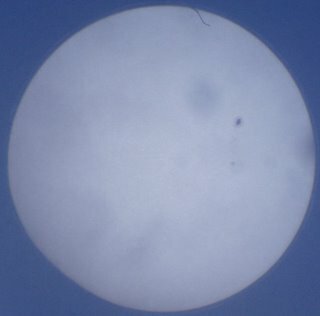 This paper was the subject of a press release, and has spread wide into the internet (Science Daily, Space.com, and SpaceInfo are just a few examples). I must say I'm mildly chuffed to be mentioned in press releases, I'm more chuffed that I was included in the paper. I've got 40 peer-reviewed papers of my own in the field of biomedical science (ask me about Maitotoxin! ), some of which I am very proud of, so I'm no stranger to being published. But this is the first time my amateur efforts have made a contribution to advancing astronomical research, my beloved hobby. 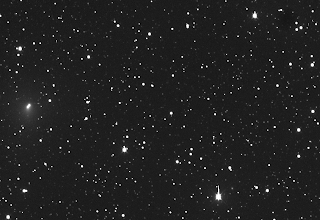 Of course, the others did all the really hard work of ground observations and calibrating the Stereo images, so my contribution needs to be put into perspective, but still.... ther's that warm inner glow that in a small way I made a difference. My blog posts on the tails (with nice images and animations and a bit more background), can be found here. Carnival of Space #170 is here. Carnival of Space #170 is now live at Breaking Orbit. This week has the Sun's decline, indigenous Australian archeoastronomy, looking for habitable extrasolar planets, new views of Mercury, where water comes from and much, much more. Fire your retro rockest and head on over. Well, I anxiously awaited the transit of the ISS over the Moon, The cloud, initially socking in the whole sky, cleared over the Moon. 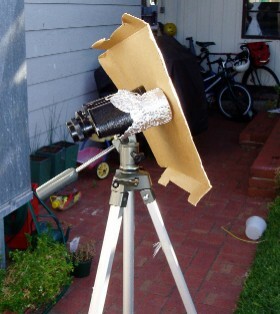 I got out Don, the 8" scope, set it up well in advance, time drive was working well. Got out the camera and ran some test videos. All was working well. With the GPS timer counting down I was fully set up 3 minutes before the passage, and I watched, and waited..
.. and by the time realised that INV on the CalSky timing link meant "invisible" and lunged for the camera on button, the ISS has crossed the Moon. Yes, it was a dark pass folks, I should have realised, but I only got the alert just before I left for work, and had to rush to get it out, then I was fooled by the Stellarium ISS tracking, which showed it as a visible pass (AHHRRGGG!!!). Yes, the only way you could have seen this was telescopically, with the dark ISS silhouetted against the Moon (And Yes, I should have double checked when I got home, but I was setting up in between getting kids into baths, washing up etc). Still, I know my wide field video setup works, even if I have 60 seconds of uninteresting video of the Moon (sigh). 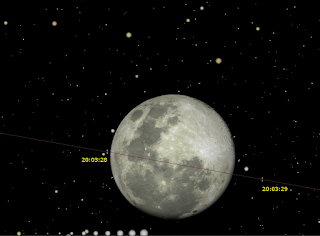 Right image; timing of the ISS passing over the Moon as seen from Adelaide (20:03:28 to 20:03:29), Left image; Chart of location of ISS and the Moon at 20:03 ACST Wednesday 22 September. At 8:03 pm on Wednesday September 22 the International Space Station will pass over the Moon as seen from Adelaide. This will be quite spectacular. It will take less than a second for the ISS to flash over the Moon, so if you want to photograph you need to be ready well ahead of time. head out at least 5 minutes before contact time to set up. Juts outside Adelaide the ISS will appear to skim the Moon, and elsewhere in South Australia is will flash close by, well worth watching. See heavens above for local timings. UPDATE: Well, that was embarrassing, I'm an idiot. 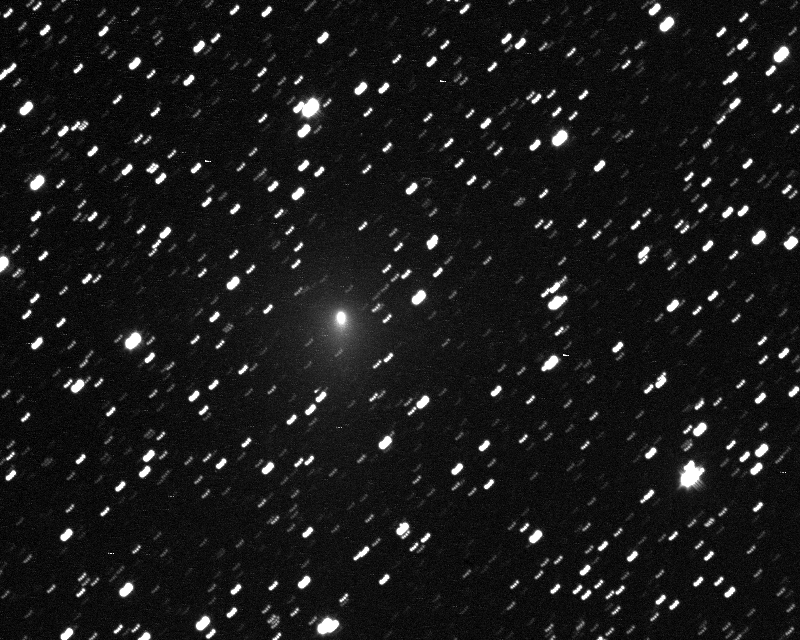 Comet Hartley as seen from the Northern hemisphere (right image) and the Southern hemisphere (left image) at 3;00 am (NH) and midnight (SH) respectively on September 21. 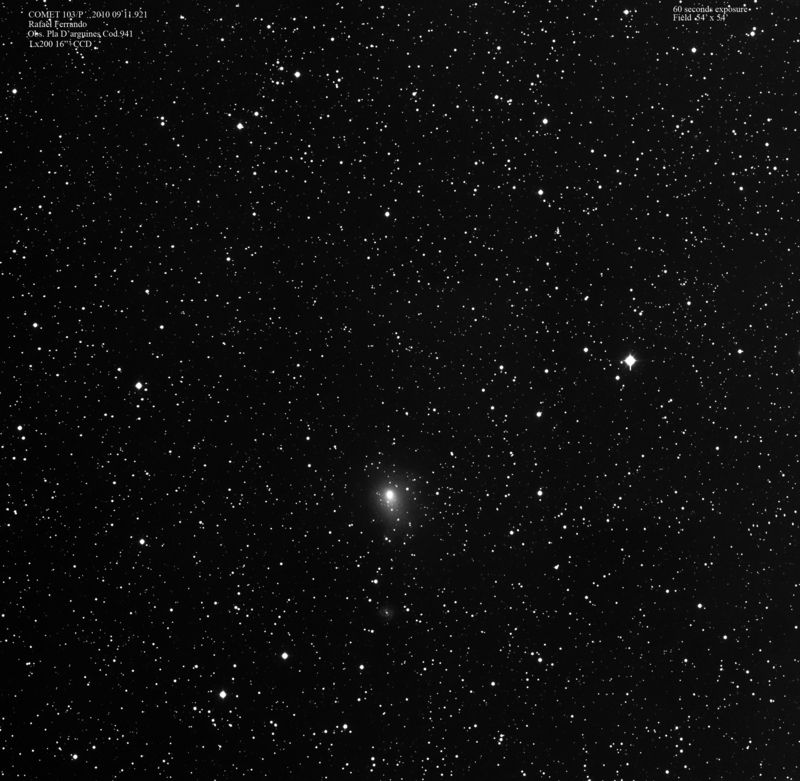 Comet 103P Hartley is currently between the Constellations of Pegasus and Cassiopea. If not for the light of the Moon, 103P Hartley would be readily visible in binoculars in the northern hemisphere, being quite high in the sky, in the southern hemisphere it is very low to the horizon, and may be difficult to see in the horizon murk, if the light of the Moon were not bad enough. 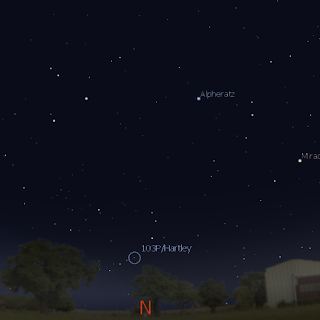 Evening sky looking East as seen from Adelaide at 8:30 pm on Tuesday September 21 showing Jupiter close to Uranus. Jupiter is at opposition at this time. Similar views will be seen elsewhere in the Southern Hemisphere at the equivalent local time. Click to embiggen. Jupiter is at opposition tonight, when it is biggest and brightest as viewed from Earth. Technically, Earth is directly between the Sun and Jupiter. The opposition is particularly good, as Jupiter is at perihelion, when it is closest to the Sun, in March 2011. So Jupiters' closest approach to earth nearly coincides with its closest approach to the Sun. This opposition is the best since 1963, an will not be bettered until 2022. You don't have to worry about rushing out tonight though. Jupiter is so big that it is always a good target in binoculars to small scopes, but for the next few weeks you should be able to see it with superb detail, when it is 30% bigger than at furthest approach. Approximate field of view through 10x50 binoculars on Tuesday September 21 showing Jupiter and Uranus. Tonight is the last night Jupiter and Uranus can be seen together in low power telescope eyepieces. After this they drift apart again. Io about to exit the face of Jupiter at 20:25 ACST (2o:55 AEST). By the time Jupiter is high enough in the sky to see in a telescope, Io and its shadow will be already on the face of Jupiter. To see Io and its shadow on Jupiter you will need a fairly decent telescope, but even in small telescopes you will see Io emerge at 20:56 (AEST) or 20:26 (ACST). When Io has exited, the great red spot makes its way across Jupiters' disk about an hour later . There are lots of opportunities in the rest of the month to see several interesting Jupiter Moon events (scroll down until you hit Jupiter and its moons). The Full Moon is Thursday September 23. 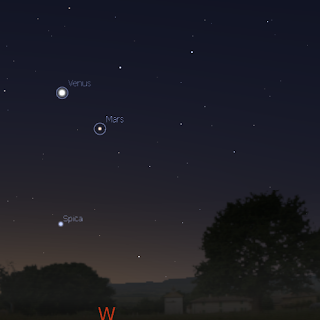 Mars, Venus and Spica form a triangle in the sky. Jupiter was at opposition, when it is biggest and brightest as seen from Earth, on Tuesday September 21. On 23 the Moon is close to Jupiter. Jupiter and Uranus are seen close together in binoculars and telescopes. Earth is at Equinox on September 23. 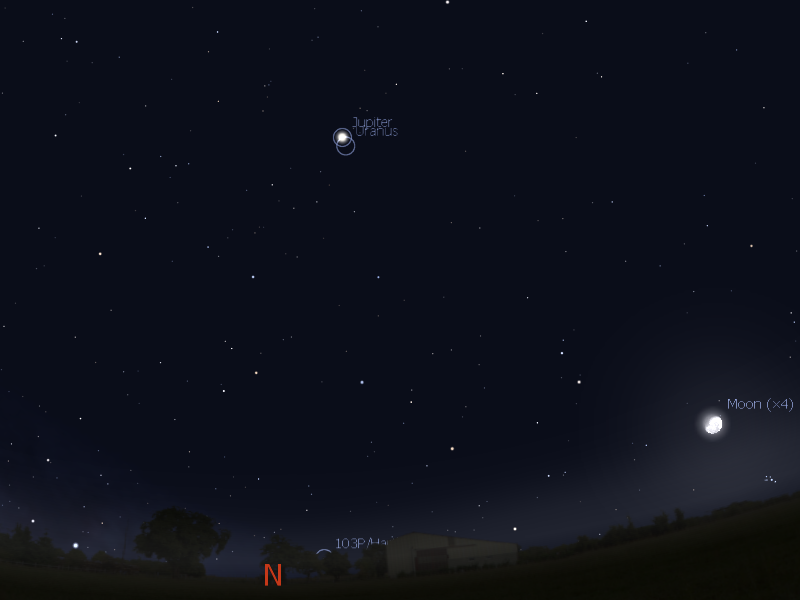 Evening sky looking East as seen from Adelaide at 8:30 pm on Thursday September 23 showing Jupiter close to Uranus. Jupiter is just past opposition, but is still excellent in telescopes and binoculars. Similar views will be seen elsewhere at the equivalent local time. Click to embiggen. The Full Moon is Thursday September 23. 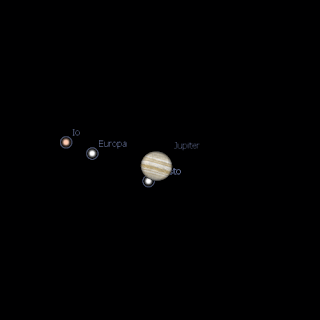 Jupiter rises before midnight, and can be readily seen from about 7:30 pm local time just above the eastern horizon. During the week you can see bright Jupiter rising in the east while Venus is still in the west. Callisto drifts below Jupiters pole on September 24 at 00:10 ACST (00:40 AEST). Jupiters' Moons are a great delight whether you have binoculars or a telescope. On the morning of Friday 24 September, Callisto drifts below Jupiters' pole. 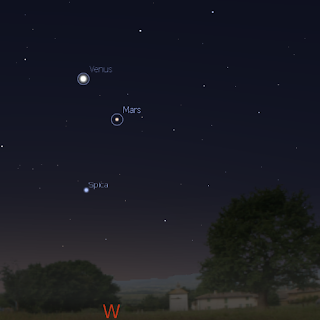 Evening sky looking North-west showing the Venus, Mars, and Spica at 7:00 pm local time on Saturday September 25. Click to embiggen. Venus leaves Virgo the Virgin this week and enters the constellation of Libra, the Balance. Venus is close to Mars , and they come cloae during the week. 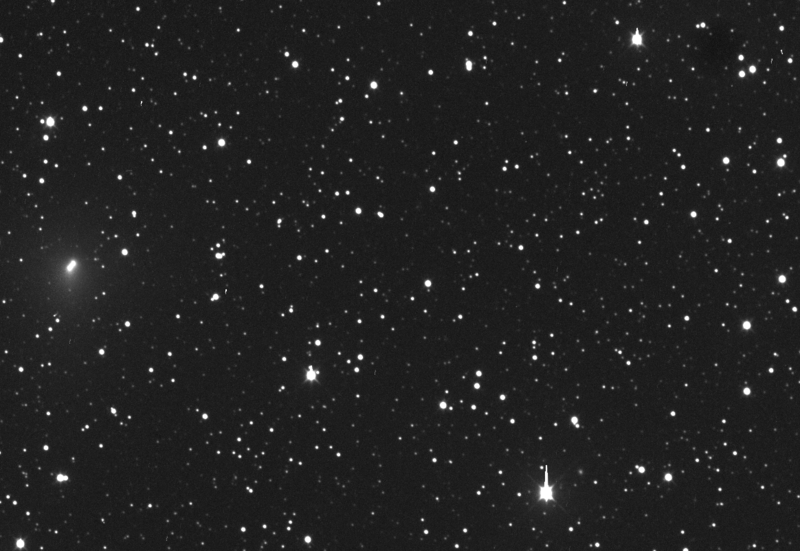 The bright star Spica (alpha Virginis) is not far below the pair, forming a triangle. Venus and is a visible crescent in small telescopes and 10x50 or stronger binouclars. Mars is distinguishable by its reddish colouring and is the brightest object below Venus not far above Spica. Parking may be available on Plane Tree Drive in Botanic Park at that time of the evening. 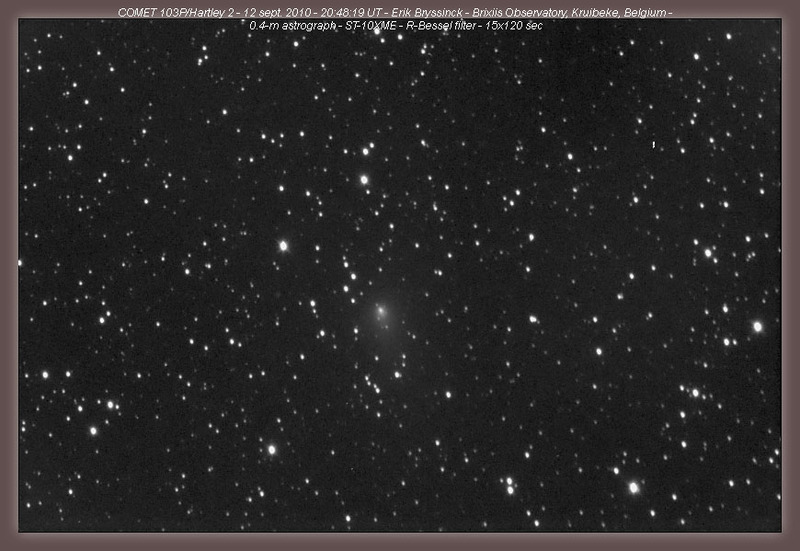 Comet 103P/Hartley is continues to grow brighter. Still below unaided eye visibility, it should be readily visible in binoculars to northern hemisphere observers. Of course, it's a small fuzzy dot, so it won't be too exciting to see. Here in the southern hemisphere, it's around a handspan above the northern horizon at midnight, and will be very difficult to gimpse through the murk of the horizon, unless you have very clear skies. These images were taken with Global Rent-a-Scope telescope GRAS-05. These are a stack of 4 x 90 second images (my previous image was a stack of 4 x 120 second images). The top image is stacked and summed on the comet, the second is stacked and summed on the stars to bring out the galaxy PGC 71451. It's, ummm, the faint fuzzy dot just near the brightest star in the frame (click to embiggen). The whirlpool galaxy it is not. Not sure if the animation will work. So, EldestOne and I completed the City to Bay fun run. We walked 6 Km, this doesn't seem much, but EldestOne has a few issues with running. It was a pretty good day, a bit of wind, and every so often we would get a sprinkling of rain. Record crowds this year, over 30,000 people, but there didn't seem to be many folks in costumes (although there were some good ones). The was a good vibe amongst the walkers, although EldestOne zoned out a bit, he had his headphones and music (he was mostly humouring me by coming along, but he actually enjoyed himself, and he may come next year). We missed his mate playing music at the finishing line (we did about 5.5 Km per hour, not bad), and I don't think I raised much money for the Brain Foundation. If you have a bit of spare cash and would like to support brain research, please visit my fund raising website at Everyday Heros. Oh, and today was International Talk Like A Pirate Day, Ahrrr Jim Lad! Well, actually September 18 was IOTMN, but as it was September 18 UT that makes it Sunday September 19 Australia time.Head over to the International Observe the Moon Night site for information and videos, or head out and have a look at the Moon. Hat tip to the Bad Astronomer. Well, EldestOne and I are about to go to the City to Bay. Looks like a nice day for it. The Bad Astronomer posts some of his favorite images from the LRO mission. Amongst these are some stunning 3D images created by Nathanial Burton-Bradford. Try the rock bridge over a lava tube, the Apollo 14 landing site and the Apollo 15 landing site and many more. Grab your 3D red-green glasses and head on over! 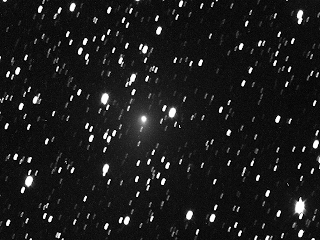 Comet 103P/Hartley is growing brighter, I hope to get some interesting images in the near future, if the weather at GRAS05 holds. In the meantime, here's some amazing images, Bernhard Haeusler's web page with animations and an image of Comet 103P passing the Whirlpool galaxy, a nice colour image from Rolando Ligustri, Dennis Persyk, another stunning image near the Whirlpool, a mosaic in colour from Rolando Ligustri, a nice image from Eric Byssnick and another animation of the comet near the Whirlpool galaxy from R. Frerrand. UPDATE: The weather at GRAS05 didn't hold up, the SOuthern hemisphere GRAS is clouded out as well, and there's clouds over my house . At the moment, Venus is prominent above the western horizon. Point your binocular lash-up at Venus, in my 10x50 binoculars Venus is very small but is a disk which has a distinct “half –Moon” shape. If your binoculars don’t have decent anti-glare coatings, you may have to observe in the early twilight in order to see Venus’s shape without internal reflections from the binocular lenses getting in the way. And now you have demolished the Ptolemaic geocentric system. Venus does have phases in this system, but quite unlike what you see here (I leave it too the reader to work out what a Ptolemaic systems Venus phases would look like, you can see a model of Ptolemaic Mercury here, which will give you a good idea). And you have only taken almost 6 months to do it (what, you thought it would be easy). 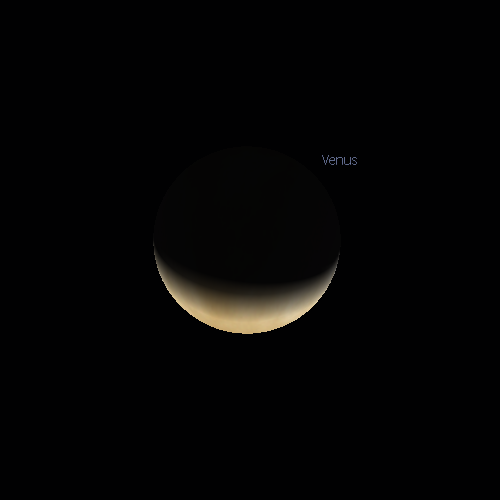 As a reward, here's an animation of the Phases of Venus. But Ah! 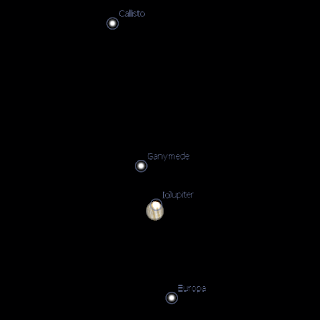 The Medicean Stars, now known as the Galilean Moons, they will shuttle backwards and forwards during the nights as you watch. The realisation that these “stars” were Moons of Jupiter were not a blow to any form of geocentrism per se, although they were the second of a series of powerful blows against the Aristotelian physics that underpinned Ptolemy’s system, which aided its demise. Determining that these specks actually orbited Jupiter, and were not just accidentally there, took a lot of effort. Anyway, while you are recording the Phases of Venus and the orbits of Jupiters’ Moons, record the passage of Sunspots over the Suns face, over the 5-6 months you are recording the susposts, you will notice the path taken by the sunspots moves up and down. This is due to the Earths orbit not being exactly in the plane of the Suns rotation. In a geocentric system, with the Sun orbiting the earth once a day, this variation would show up on a daily basis, but what you observe can only be seen in a heliocentric system. So, congratulations, you have just demonstrated that geocentric models don’t describe the solar system we see using very simple tools. It took a while, and was hard work, but you have demonstrated it yourself, and all the blovation of geocentricists won’t take that away (yes, Stellar parallax gets all the glory, but annual Sunspot variation was a powerful blow to Tychonian geocentric models). If you want to, you can take this further by making your own Foucault's Pendulum. No, it's not two iridium flares simultaneously, but something not too bad, two flares within a minute of each other, in almost the same location. The sky was pretty cloudy, and those flares are showing up through the cloud. I took two separate pictures then overlaid them in the GIMP. The resuting picture is a little brighter tha the originals, but the clouds were reflecting a lot of light. The Full Moon is Thursday September 23. 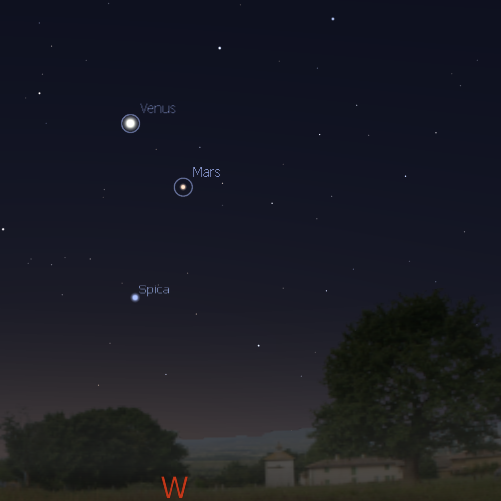 Mars, Venus and Spica form a triangle in the sky. 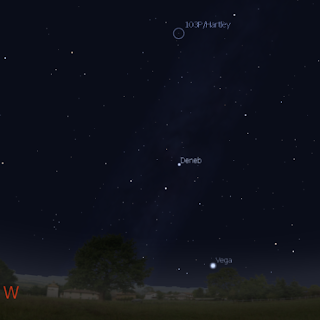 Jupitet is at opposition, when it is biggest and brightest as seen from Earth, on Tuesday September 21. On September 22 and 23 the Moon is close to Jupiter. Jupiter and Uranus are seen close together in binoculars and telescopes. Earth is at Equinox on September 23. 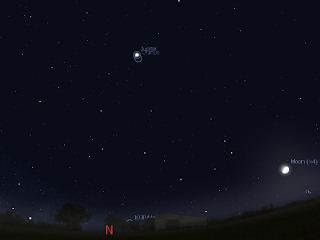 Evening sky looking East as seen from Adelaide at 8:30 pm on Tuesday September 21 showing Jupiter close to Uranus. Jupiter is at opposition at this time. 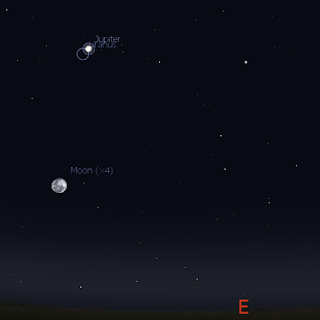 Similar views will be seen elsewhere at the equivalent local time. Click to embiggen. 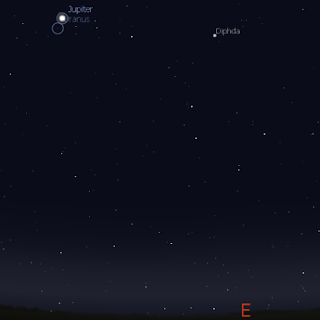 Jupiter rises before midnight, and can be readily seen from about 7:30 pm local time just above the eastern horizon. During the week you can see bright Jupiter rising low in the east while Venus is still in the west. 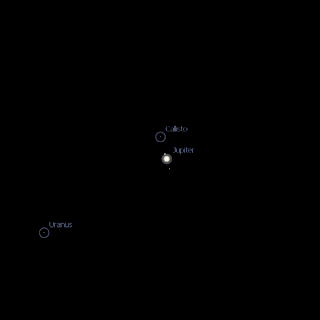 Approximate field of view through 10x50 binoculars on September 21 showing Jupiter and Uranus. Between the 16th and 21st of Spetember, Jupiter and Uranus can be seen together in low power telescope eyepieces. After this they drift apart again. Jupiter is still visible in the early morning in the north-western sky as the brightest object low above the horizon. Jupiters Moons are a great delight whether you have binoculars or a telescope. On Tuesday 21 September, there is not only the opposition, but there is a transit and shadow transit of Io as well. Evening sky looking North-west showing the Venus, Mars, and Spica at 7:00 pm local time on Monday September 20. Click to embiggen. Venus is in Virgo the Virgin, close to Mars and not far from the bright star Spica (alpha Virginis) forming a triangle. 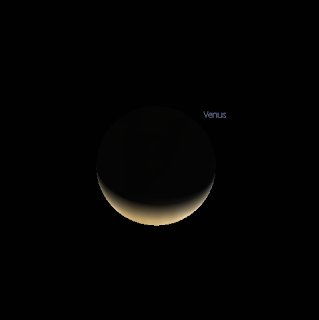 Venus rises higher during the week, and is a visible crescent in small telescopes. Mars is distinguishable by its reddish colouring and is the brightest object below Venus not far above Spica. During the week Mras and Venus come closer. A couple of weeks back Professor Ian Plimer gave a seminar in my School, this week, it was the turn of Professor Barry Brook, who runs the Brave New Climate blog (as well as doing climate change research of course, but this is a major outreach effort so I'm highlighting that). Professor Brooks talk was the antithesis of Professor Plimers. Consistent, logically developed, and a very good summation of our understaning of climate change. He also spoke about the various energy options we have for mitigation, and real world examples of mitagations schemes to reduce carbon emissions (contrasting France and Denmark as one example of neuclear vs wind power). One thing was clear, was that work on mitigation schemes must occur soon, if serious climate change is to be avoided. You can read more about the energy issues at Barry's blog, so I won't go into detail here, but I would like to point to the Oz-Energy Analysis site, and Open Science site where sustainable renewable energy options are being investigated. Have a look and get involved. Like last time I was unable to stay and ask questions, haveing too run a workshop, but I did learn the Barry was an amateur astronomer when he was younger! Carnival of Space #168 is now up at the Next Big Future. There's natural bridges on the Moon, inconstant constants, pictures of exoplanets, signalling extraterrestrial civilizations and much, much more. Pop on over and have a look. One of my obsessions joys is observing, and helping other people observe, Venus in the daylight. This Saturday I was able to show some of our and EldestOnes friends Venus. It was actually easier to pick out Venus than the faint crescent, and I occasionally had to use Venus to guide me to the Moon. It sort of made up for not being able to see the Massing properly. Left Image, Venus and the crescent Moon peek through the clouds in the early evening. Right Image, Venus, Moon, Mars and Spica through a rare hole in the clouds later in the evening. Click to embiggen. Yeah, planetary massing, transit of Europa, you knew what was going to happen right? And it looked like it was going to be fine. EldestOne had friends over, and I dragged them out to see Venus in the daylight. Then the clouds came over. Still, I did get some glimpses of the Massing through the clouds, so it wasn't all bad. Evening sky looking North-west showing the Crescent Moon, Venus, Mars, Spica and Saturn at 7:00 pm local time on Saturday September 11. Click to embiggen. This Saturday see a rather delightful grouping of Venus, Mars, the bright star Spica and the Crescent Moon. You can cover this collection of worlds with one hand. The best views will be between 6:45 and 8:30 pm. In you are in Adelaide, and have to leave the Royal Adelaide Show before the fireworks, look to the west and this celestial display may make up for it. Left image, Europa enters the disk of Jupiter at 20:10 ACST. 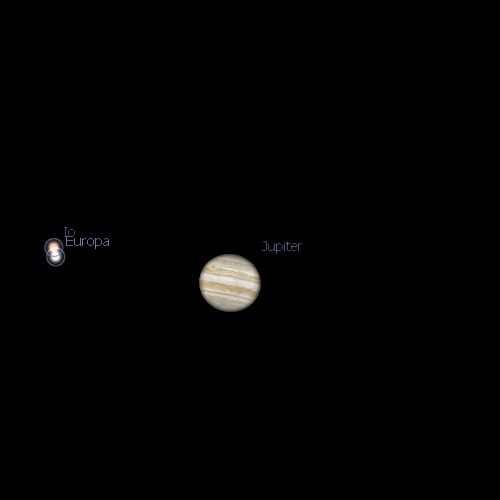 Right Image, Europa leaves the disk of Jupiter at 22:50 ACST. On Saturday 11 September, there is not only a great massing of the Moon, Venus Mars and Spica, but there is a transit and shadow transit of Europa as well. As Venus and the Moon are setting Europa begins it's journey across the face of Jupiter, preceded by its shadow. To see Europa and its shadow on Jupiter you will need a fairly decent telescope, but even in small telescopes you will see Europa merge with Jupiter, then emerge a few hours later. When Europa has exited, the great red spot makes its way across Jupiters' disk as well. With Jupiter nearing opposition this month, there are lots of opportunities to see cool Jupiter Moon events (scroll down until you hit Jupiter). Happy observing! Comet 103P/Hartley 2 as imgaed by the re-purposed Deep Impact spacecraft EPOXI, image credit NASA. 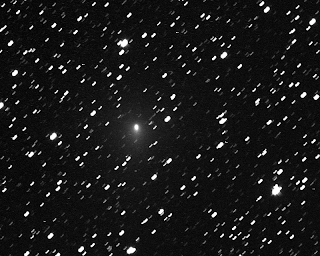 The EPOXI mission, which sees the Deep Impact spacecraft fly by comet 103P/Hartley on November 4, has begun posting its images of the comet. They will start off posting an image a week, and will increase the frequency as the comet comes closer. Bookmark this link to check for updates. It's interesting to compare the spacecraft image with some of the latest amateur images. There is this wonderful colour image from Michael Jäger and a great image of the comet near a galaxy and nebula by Martin Gembec and finally a wide field view from Rob Kaufman in Victoria. They compare pretty weill to the spacecraft. Left image Jupiter above the eastern horizon, Right Image, Venus above the western horizon, both at the same time in the evening. If you go out tonight and over the next few days at around 8:15 pm you will see an interesting sight (well, at least to me). If you look to the west, you will see bright Venus sinking towards the horizon, and if you look to the east you will see bright Jupiter rising. This is not so surprising, butr at roughly 8:15 pm they are approximately the same distance from the horizon. So spin around, and see the bright planets dance. Western horizon as seen at 6:30 pm ACST on Thursday September 9 in Adelaide, similar views will bee seen elsewhere in Australian at equivalent local times. 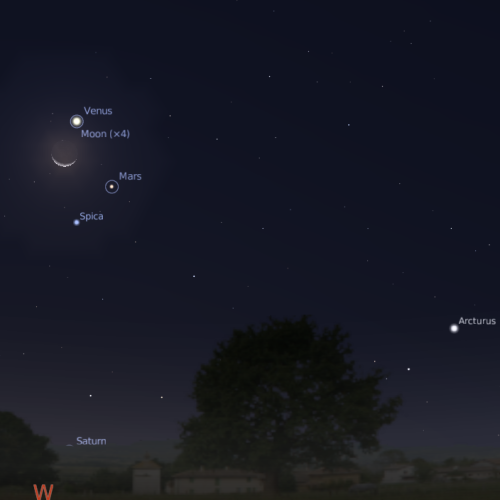 On Thursday September 9 the thin crescent Moon is near Saturn. This will be quite difficult to see if you do not have a clear, level western horizon (and Saturn will be dim in the twilight), but if you do have a clear horizon, it will be worth the effort to see the pair below the trio of Venus, Mars and Spica.